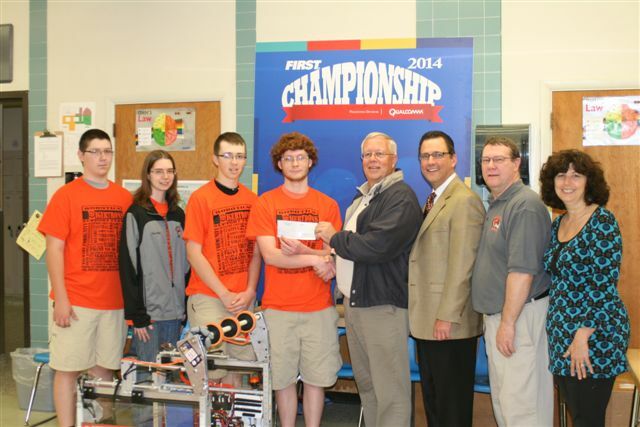 The Board of Directors of NEPIRC recently provided support to the Tunkhannock High School Tigertrons Robotics Team to further their progression through the national U.S. First Robotics Competition. With NEPIRC support, the team went on to win the Rockwell Automation Innovation in Control Award and placed as a Finalist in the Mid-Atlantic Region competition and Semi-Finalist in two other competitions across the country. The team, which consisted of 12 students, six engineering mentors and seven non-engineering mentors, invested a total of over 11,000 hours in the design, building, testing and competition of their robot, which was required to remotely navigate a playing field, pick up and stow a ball, avoid moving and stationery obstacles, and shoot the ball into designated scoring slots. The robot also had to work in collaboration with other team robots to pass the ball, block opponents and create additional scoring opportunities. The team recorded a final record of 39 wins and 22 losses. The team consisted of two senior students, one of which plans to attend Clarkson University to pursue a degree in Engineering. NEPIRC Past-President Pete Butler and Executive Director Eric Joseph Esoda present Tigertrons Coach, Scott Howell, along with Tigertron team members, with support enabling them to move further into their competitions.